Every dashing young man deserves an accessory he can call his own, and JustMensRings.com may have the perfect solution to complement his one-of-a-kind personality. We proudly present the matte-finished black titanium wedding band with diagonal grooves, the newest accessory to grace our collection. 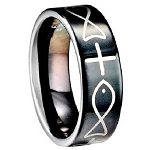 This ring was designed and manufactured with careful attention to detail. Thanks to aircraft-grade titanium, you won’t have to worry about this ring scratching, denting, or discoloring over time. Titanium will also never lose its shine and is so durable that it’s used in numerous aeronautical applications. 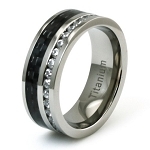 Every 6mm men’s matte-finished black titanium wedding band with diagonal grooves we offer is available in a wide variety of sizes, so you’re guaranteed to find your perfect size. 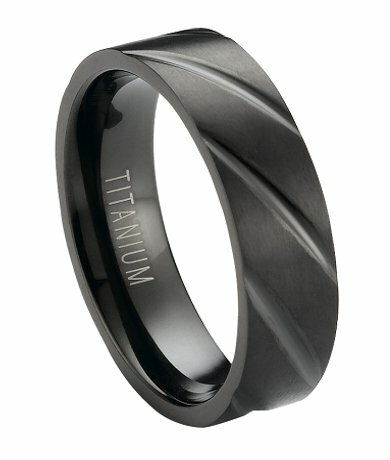 Whether you are planning for the big day or celebrating your anniversary with a brand-new ring, the matte-finished black titanium wedding band with diagonal grooves will certainly be a great way to share his commitment with the world. Diagonal grooves create a swirling pattern that encircles the flat profile. 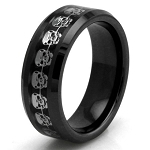 Each 6mm men’s matte-finished black titanium wedding band with diagonal grooves is designed in the comfort-fit style, to accommodate larger knuckles. Comfort-fit wedding bands usually measure a half size smaller than traditional bands, and we recommend that you have your finger sized by a professional jeweler to ensure that the comfort-fit style is right for you. If you have any questions or concerns about this ring or need help finding a specific product, please contact a member of our team for further assistance. I am very pleased my new ring. It is exactly what I was looking for. We love the ring and the service. We had to exchange the ring for a different size and he wont take it off!